The attacks of 9/11 led to a war on Iraq, although there was neither tangible evidence that the nation’s leader, Saddam Hussein, was linked to Osama bin Laden nor proof of weapons of mass destruction. Why, then, did the Iraq war garner so much acceptance in the United States during its primary stages? Mass Deception argues that the George W. Bush administration manufactured public support for the war on Iraq. “critical communication” to explain how and why political leaders and the news media periodically create public panics that actually benefit both parties. Using quantitative analysis of public opinion polls and presidential rhetoric pre- and post-9/11 in the news media, Dr. Bonn applies the moral panic concept to the Iraq war--that is, he demonstrates how the Bush administration created a self-serving public panic in the U.S. after 9/11 over alleged Iraqi weapons of mass destruction with the support of the news media. 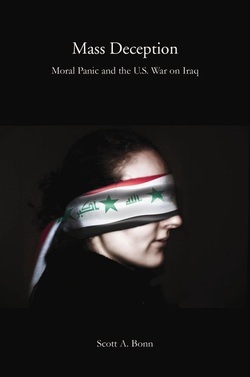 He critiques the war and occupation of Iraq as violations of domestic and international law. Finally, Mass Deception connects propaganda and distortion efforts by the Bush administration to more general theories of elite deviance and state crime." Doc Bonn's current popular book on the public’s interest in serial killers titled, “Why We Love Serial Killers” was published by Skyhorse Press and launched in October 2014. Foreword by journalist and author, Diane Dimond. "Considered one of the world's top experts on criminal behavior, Scott Bonn has delivered a book which is so powerful and provocative, you cannot put it down. Indeed, through his diligent work and unparalleled access to these infamous killers who've committed some of the most horrific crimes of our day, he provides chilling and critical insight into these deviant and pathological criminal minds… and reveals the truth behind the headlines." Copyright 2012-2016 @Dr. Scott Bonn all rights reserved.